The Art Gallery of the Spiritual Growth Centre is eye catching and a treat for art lovers. Very attractive and exquisite paintings and wood carvings are on display in this section of the Spiritual Growth Centre. 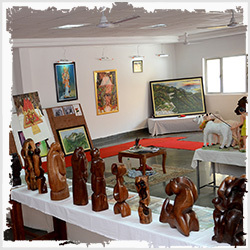 Presently, 300 small and large size art creations in water and oil medium on themes relating to Shri Mata Vaishno Devi and Trikuta Hills have been displayed in the Art Gallery, while a series of paintings about Shri Mata Vaishno Devi Shrine and other spiritual places of Jammu and Kashmir are being added to the treasure trove of the Art Gallery.